- Tromsø International Film Festival, Norway, January 07. - New Orleans Int. Human Rights Film Festival, USA, April 07. - Norwegian Documentary Film Festival, Volda, April 07. - HotDocs, Toronto, Canada, April 07. - Tampa Theatre, USA, special screening, May 07. - Norwegian Short Film Festival Grimstad, June 07. - LaborFest 2007, San Francsico, July 27th. - Beach Theater in St. Pete Beach FL, August 20th at 6:30 p.m. and 9 p.m. as part of WMNF's The Reel Truth film series. - Civic Media Center Film Presentation in Hippodrome State Theatre, Gainesville, Florida. Sept. 3rd. - International Muslim cinema «Golden Minbar», Kazan, Russia September 06-12th. (director/ producer present). - Trondheim filmklubb, Norway. 19 Sept. 07. - Alta filmklubb, Norway. 20 Sept. 07. - VIVISECTfest Human Rights Festival, Novi Sad, Serbia. 21-25 Sept.07. - AICafè, Beit Sahour/Betlehem, September 25th, Palestine (photographer present). - Nordisk Panorama, September 21.-26th, Oulu, Finland (producer present). - DOCNZ International Documentary Film Festival, New Zealand. Four cities 27 Sept. - 21 Nov. 07. - Boston Palestine Film Festival, September 25th - October 7th. - Cinemambiente International Environmental Film Festival, Torino, Italy. 11-16 Oct. 07 (director present). - Document 5 Glasgow, Scotland, UK. October 17-21th. - Femmina Internasjonal Filmfestival, Verdal, Norway. 25 - 28. Oct. 07. - Columbia University Law School, Jerome Green Room 106. October 25 at 6:00pm. SIPA Arab Student Association. US. - Århus Film Festival, Denmark, October 07. - Arab Film Festival, San Francsico, October 18-28th and Los Angeles October 31- November 4th (director and producer present). - United Nations Association Film Festival, Palo Alto CA, October 24-28th and Traveling Festival Screenings (check festival web). (director and producer present). - Festival of Liberties 2007, Bruxelles, Belgium. Oct 31- Nov 10. - The Kettupäivät - Finnish Short and Documentary Film Festival, 7-10. November 07. - The USF Ballroom. Tampa, US. November 9th. - CPH:DOX, Copenhagen, Denmark. 9-18 Nov. 07. - DocLounge, Malmö, Sweden 19 Nov. 07. - The Festival dei Popoli, Florence, Italy. 16-22 Nov. 07. - Dubai International Film Festival, December 9-16, 2007. - University of Pennsylvania Law School (Room Gittis 214), January 30, 7 PM. Philadelphia, US. - Thomas Jefferson Unitarian Church, Louisville, KY. January 13, 2008. - SESAME's 5th Annual Middle East Film Festival, Evergreen State College, Olympia, Lecture Hall 1, February 12th 7 PM, 2008. - DocsBarcelona, International Documentary Festival, 31 January to 3 February 2008. Spain. - Unitarian Universalist Fellowship of Salisbury, MD. February 3. - Harstad Filmklubb, Norway. 9 February 2008. - Bellingham Human Rights Film Festival, Washington DC. February 27, 2008 . - First United Church of Tampa, February 29. USA. - First Congregational Church of Houston, TX. March 9. - Tempo Documentary Festival, 5-9 March 2008, Stockholm, Sweden. - Live Oak Unitarian Universalist Church, , March 12. 7:00 p.m., Cedar Park, (Austin) Texas. USA. - Phoenix Quaker Meeting, March 14, info call 602-762-1975. Phoenix, AZ. USA. - Islamic Center of Irvine,Irvine, CA. March 16. - Islamic School of Seattle, March 16. - University of California Irvine, CA. March 17. - College Community Congregational Church, March 25, 7:00 p.m., info call 815-210-8286. Fresno, CA. USA. - The 10th Amnesty International Film Festival, Amstedam. March 26-30. 2008. - March 31, 8:00 pm: University of Texas. Monday, Austin, TX. USA. - April 3, 7:00 pm, UNC Nelson Mandela Auditorium, FedEx Global Education Center, Chapel Hill, NC. Al-Arian family members and director present for Q&A. - April 5, 06:15 pm: 'A Night of Solidarity With Political Prisoner Sami Al-Arian' with Al-Arian family members director Line Halvorsen present. Islamic Center of Charlotte-South, 559 N. Polk St. Pineville, NC. USA. - April 6th: UNC Greensboro. Al-Arian family members and director present for Q&A. - April 7, 06:00 pm: Washington College of Law, room 602, 4801 Massachusetts Ave NW Washington DC. - April 7, 08:00 pm: Griffith Film Theater in the Bryan Center on Duke's West Campus, Screening + discussion w/ director Line Halvorsen and attorney Peter Erlinder. - April 8th: Galaxy Theater in Cary. Al-Arian family members, lawyer Peter Erlinder and director present for Q&A. - April 9, 03:00 PM: Charlotte School of Law, Harding Room 201 (1225 Harding Place, Charlotte, NC 28204). Q&A with Peter Erlinder, Al-Arian’s attorney and Constitutional Law Professor. - April 9, 07:30 pm: Community Church in Chapel Hill. Hosted by Balance & Accuracy in Journalism. Nahla Al-Arian present for Q&A. Free entrance. Maryland Stamp Student Union. Guest Speaker: Laila Al-Arian. - April 11, 07:30 pm: Mas Youth Center North Carolina. - April 12. 07:30 pm: Islamic Society of Milwaukee, 4707 S. 13th Street (13th & Layton). With Law Prof. Peter Erlinder. - April 12, 04:30 pm: Belfast Film Festival, Ireland. - April 17, 07:00 pm: Los Angeles, USA. Woodbridge 5 Theater, located at 4626 Barranca Parkway, Irvine. Panel after film: Laila Al-Arian and Ahmed Bedier, CAIR. - April 18, 03:00 pm: UCLA Campus, 405 Hilgard , Los Angeles. The law building. After the screening; panel with Laila Al-Arian, Salam Al-Marayati (MPAC) and Khaled Abou El Fadl (UCLA Law Professor). - April 20: London Palestine Film Festival, England. - Aljazeera International Festival 2008, April 21st to April 24th, 2008 at Doha – Sheraton hotel Doha, Qatar. - April 22, 07:00 pm: CAIR Orlando at Rollins College, Bush Auditorium (in the Bush Social Science Center). Laila Al-Arian present for Q&A. - April 24, 7:00 pm: CAIR Nevada/ Muslims students association: University of Nevada Las Vegas, Wright Hall C 144. . Las Vegas, USA. - May 06 - May 11, 2008: Tekfestival, Rome, Italy. - June 24 and 25: Human Rights Watch Film Festival, New York. - August 22-29: Short & Docs Film Festival, Reyjavik, Island. - September 2008 - May 2009: Human Rights Watch Traveling Film Festival (tour) , US / CANADA. - October 18-27: Nordox, Nordic Documentary Film Festival Beijing, China. - October 25 - November 1, 2008: Toronto Palestine Film Festival, Canada. - November 23, 2008: The Human Rights Arts and Film Festival, Australia. - December 2008: Movies that Matter Film and Debate Programme (tour), Holland. - November 6, 7 pm: Free screening, Maverick 4 Theater, 12 Civic Center Plaza, Mankato, Minnesota. - November 9, 2008: 6:00 pm, Hovde Lounge, Preus Library, Luther College, Decorah, Iowa. - November 10, 2008: 4:00 pm Fulton MO William Woods University, Mock Courtroom, Burton Building. - November 10, 2008: 7:30 pm Columbia MO Stephens College, Charters Auditorium, located in Helis Center. - November 11, 2008: 7:30 pm, Columbia MO University of Missouri, Ellis Library Audiorium. - November 12, 2008: 7:00 p.m, Center for Theology and Social Analysis,St.Louis, MO. - November 13, 2008: 8:00 p.m. International Human Rights Program Webster University, St. Louis, MO. 100 South Taylor Av, St Louis, MO. (director not present). - February 13-15, 2009: Hamilton College, Clinton, New York. - February 16-19, 2009: University of Cincinna, Cincinnati, OH. - February 17,24 and March 3: Cornell Cinema, Ithaca, NY. - September 9, 2009. 7 PM: European Media Event -DocScapes. Beursschouwburg, Rue A. Ortsstraat, 28. Brussel. - September 19, 2009, 6:30 PM: The University of Miami School of Law. - September 20, 2009, 6 PM: Kapittel Festivalen, Stavanger Cinema. Norway. Church, 310 Lowell Street, Elyria, Ohio. - October 13, 2010, 3:30 - 7:30 PM: RightsFest Film Festival, Keith center for civil rights. Detroit, Michigan. 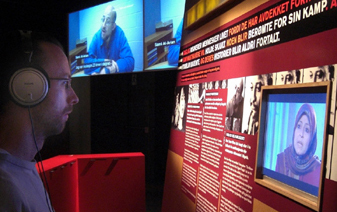 On 25 September, the Nobel Peace Center opened the exhibition "Freedom of Expression - How Free is Free?". The exhibition presents people who have pushed the boundaries of freedom of expression, such as Anna Politkovskaja, Aung San Suu Kyi, Sami Al-Arian, Salman Rushdie, Theo van Gogh and many more. The exhibition can be seen in Oslo, Norway until 25 May 2008. More CLICK HERE. "USA vs Al-Arian" was awarded Best Nordic Documentary at the Nordic Panorama in Finland September 25th.The jury said the following when presentig the award. The film gives us a unique access to a family in crisis and offers a perspective which might often be missed. The director insists on sticking around to capture the moments.The film shows precisely how a common man becomes a victim of the situation in the contemporary world, where the Big Brother is watching you even when you´re ordering pizza. The film combines all the elements any documentary needs: a powerful story, strong characters and an emotional journey well crafted together. 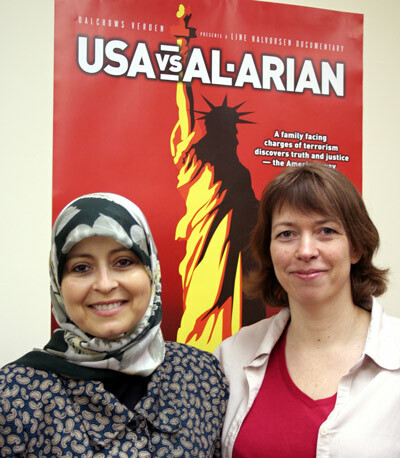 USA vs Al-Arian was also screened at New Orleans International Human Rights Film Festival in April. This is a festival dedicated to nurturing New Orleans’ human rights community and linking local issues to international issues. USA vs Al-Arian won the festival's official Jury Prize for best film. Nahla Al-Arian and two of her children, Laila and Abdullah Al-Arian, were invited to Norway to attend the cinema premiere in February. Also Sami Al-Arian’s lawyer Linda Moreno came to visit a freezing Oslo. By clicking HERE you’ll find pages in our archives that will tell you a little about their stay in Norway. Our web pages are continuously being updated. By clicking HERE you’ll find the latest news on the case of Sami Al-Arian and also the latest on his condition. You can find links to articles and media clips about the film by clicking HERE. Chicago Sun-Times April 4, 2012: Just a few months ago, our President signed the National Defense Authorization Act 2012 after almost unanimous bipartisan support in both the House and Senate, while the media almost unanimously ignored it. This is that same troubling act that permits indefinite detentions of American citizens without trial. READ MORE. USA VS AL-ARIAN DVD - SPECIAL EDITION OUT NOW! The special edition of "USA vs Al-Arian" is distributed by Kudos Family, and is now available on amazon.com in NTSC and PAL. The new DVD is available with English, Spanish, French, German, Italian and Arabic subtitles, and includes 1h 52 min with bonus material. - Interview: Sami Al-Arian, Orient Road Jail, Feb 2006 - Short: Look For Me – The Children of Gaza (dir. Tone Andersen) - Interview with Laila Al-Arian, Democracy Now! September 2008. AL-ARIAN AT GLOBAL FORUM ON FREEDOM OF EXPRESSION. While the former professor in computer science at University of South Florida, Dr. Sami Al-Arian remains in house arrest in the US, his wife and daughter, Nahla and Laila Al-Arian will attend the Global Forum on Freedom of Expression in Oslo, Norway on his behalf, Friday June 5th. They will host the seminar, “The Ultimate Test of Democracy: The Right To Dissent - USA vs. Al-Arian” written by Sami Al-Arian. YouTube VIDEO: AMERICAN JUSTICE SYSTEM IN CRISIS? 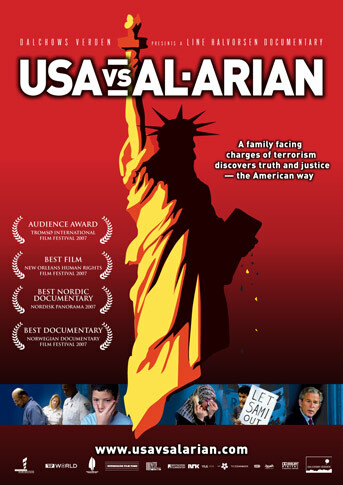 Link TV had the U.S. television premiere of the 52 minutes TV-version of "USA vs Al-Arian" in April. The film will also be screened in May: Monday, May 4 at 11:00 p.m., Wedensday, May 7 at 03:00 a.m. and Thursday, May 8, 2008 at 08:05 p.m.
For more information and to see a clip from the film, CLICK HERE. Link TV is a nationally broadcast television channel devoted to providing diverse global perspectives on news, current events and world culture not typically available on other U.S. networks. The channel has garnered the support of Bill Cosby, Dave Matthews, Cher, Danny Glover, Harry Belafonte, Bonnie Raitt, Willie Nelson and others. More info about how to get Link TV CLICK HERE. WASHINGTON DC PREMIERE - SOLD OUT! 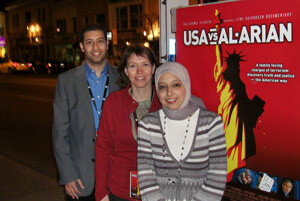 "USA vs Al-Arian" was screened at AMC/Loews Uptown 1 Theatre in Washington DC December 5th for a full house. Audience members wanted to know what they could do to help. Law professor David Cole said citizens can build political support for Al-Arian. "This case and the Guantanamo debate shows that the U.S. can lock humans up indefinitely without charges because they are foreign nationals," Cole said. "It's a double standard that we would not tolerate if taken against us." Al-Arian's family is trying to find a country that will accept him after his deportation. "It's a sad day when you have to leave the U.S. to be free," Abdullah Al-Arian said, drawing applause from the crowd. Read more here. "Excellence in Journalism & Creative Arts Award" - The award was presented by chairman of AMA, Dr. Agha Saeed: "For arguably making the best movie of the year about the civil rights crisis in the United States; For exposing the draconian character of the USA PATRIOT ACT; For showing courage of conviction in highlighting the plight of one of America´s most prominent political prisoners, Dr. Sami Al-Arian and his family; For raising consciousness all over the globe about the centrality of the issue of Palestine to world peace." Norwegian Film Award - Amanda. Nahla and Lama Al-Arian were welcomed as guests in Norway. Here together with director Line Halvorsen just before the award show. The nominations were celebrated in Haugesund. (photo: Helge Hansen). Between April 24 and 29. Volda is what matters when it comes to watching documentaries in Norway. Since 1997, this has been the venue for the best Norwegian and International documentaries. USA vs Al-Arian was awarded for best film and got the prestigious Flugeprisen. 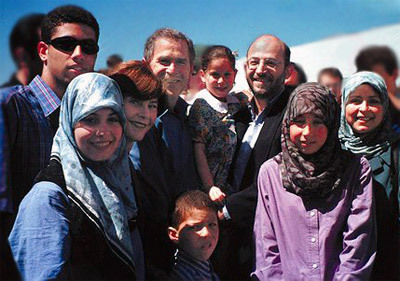 Over: The Al-Arian family meets Laura and George W. Bush during Florida Strawberry Festival March 2000. Under: Nahla Al-Arian was separated from her husband Sami who was arrested in February 2003 by the American Government. The Norwegian documentary "USA vs Al-Arian" premiered Friday Apiril 20th at HotDocs, eliciting moviegoers' outrage towards the US justice system and its treatment of the Al-Arian family. 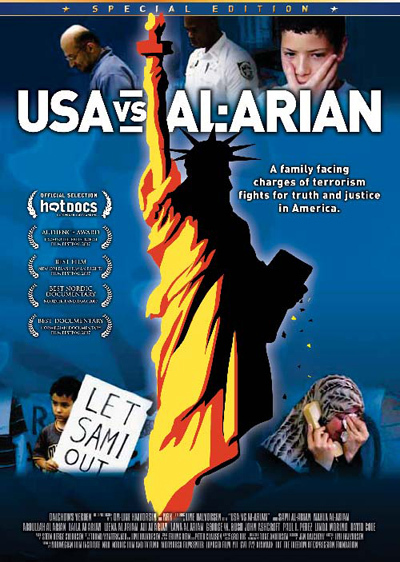 The film portrays an American Muslim family facing charges of terrorism through the trial of Sami Al-Arian. While his children traveled to the Toronto premiere of "USA vs Al-Arian", imprisoned Palestinian activist Sami Al-Arian has been on a special tour of his own. So far this year, he has been transferred from prison to prison nine times, four times in April alone. Al- Arian went through a six-month trial in which he was acquitted on the most serious charges. Although the jury voted 10-2 in favor of acquittal on the remaining counts, the government threatened a re-trial on those charges. In a 2006 agreement, Al-Arian plead guilty to one count of giving non-violent assistance to immigrants associated with an illegal organization and the government agreed to release him and allow him to leave the country. However, they have not honored this agreement. Currently Al-Arian is held under severe conditions in a prison about 1000 miles away from his family, making it extremely hard for them to keep in touch with him. Al-Arian recently went through a 60-day hunger strike to protest the government’s treatment. "The conditions under which Dr. Al-Arian has been detained both during his pre-trial detention, and since his sentencing appear to be unacceptably harsh and punitive," the human rights group Amnesty International wrote in a February letter to the US Attorney General. “It was quite a strange experience to see our lives portrayed on the big screen like this. But seeing everything that happened during the trial again brings back both good and painful memories,” Abdullah said. After the Toronto premiere Friday, director Line Halvorsen received a lot of praise, but also some accusations of bias. “It is a personal story seen through the eyes of a family, but the film is clear on the facts. We give the government a lot of screen time and the opportunity to present its point of view. But in the end, what we have is a man found innocent who is still harassed by the justice system. I hope the film will make people aware of the faces behind the headlines and the cases behind the laws. 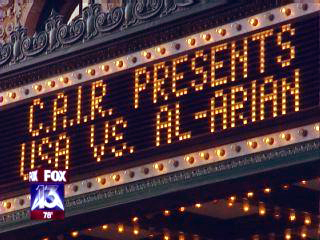 The Tampa Premiere of the critically acclaimed documentary film USA vs Al-Arian played for a sold out theatre May 16, 2007. The Tampa office of the Council on American-Islamic Relations in cooperation with Friends of Human Rights and Amnesty International Tampa Bay local #240 presented the film at The Tampa Theatre. "He's a man of principle, " Halvorsen told the crowd during a brief introduction. "He fights for what he believes in and he's not afraid to speak his mind." The audience cheered when the not-guilty verdicts were read. Some laughed derisively at the comments of U.S. Attorney Paul Perez, who defended his office's decision to prosecute Al-Arian. After the movie, several of the trial's key players gathered for a panel discussion. From St.Petersburg Times. More click here. Over: From Fox13s coverage of the event. Click the picture to see video. You can now join the films group on Facebook to keep you updated. Click here to check it out. Open forum: Write you opinion - CLICK HERE.